An abstract painting called "Woman-Ochre" is a work of the famous Dutch-American artist William de Kooning. The painting used to hang in The University of Arizona Museum of Art. That is until "Woman-Ochre" was stolen from the museum in 1985. It had not been seen since then. But that changed recently when a man who sells artwork and furniture visited a home in a small town in New Mexico. David Van Auker sells old furniture and paintings in his store in Silver City, New Mexico. He was invited to a home nearby to see if there was anything he wanted to buy so he could sell it in his store. At first, Van Auker thought he found a print of the de Kooning painting. Upon a closer look, however, he realized it was real paint on canvas. Van Auker thought perhaps the home's former owner liked to paint and made a copy. Eventually, he bought the painting and everything else in the home for $2,000. When Van Auker put the painting up for sale at his store, some people said they thought it was an original. That made him think. So he researched the painting and found a story from a newspaper in Arizona. 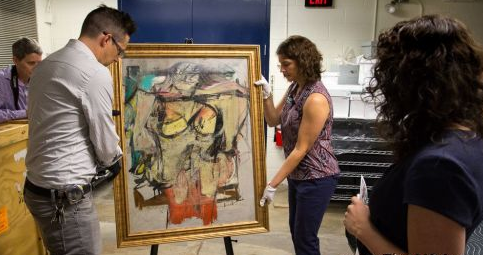 The headline read: "De Kooning Painting Valued at More Than $100 Million Missing for 30 Years." The painting looked exactly like the one he had in his hands. So he called the university and told the museum he thought he had its missing painting. After a number of telephone calls, Van Auker took photos and emailed them to the university. They were sure he had something important. So the next day, a number of people drove about three hours to Silver City. The group borrowed the painting and brought it back to the school in Tucson. After careful study, they decided it was the original, stolen 32 years ago. De Kooning made the painting in the 1950s. A similar painting sold in 2006 for $137.5 million. Experts say the recovered "Woman-Ochre" may be worth $160 million. Meg Hagyard is the acting director of the museum. She thanked Van Auker for returning the painting. She called its recovery a "monumental moment for the museum." Van Auker said the experience of finding the lost painting was "one of the most important moments in my life." Since then he has been drawing a pension. At first they all thought I was a loony. Their friends suggested they should put up their prices. He died after a brave but unavailing fight against a terminal illness. 1.The painting looked exactly like the one he had in his hands. Everyone said that I looked exactly like my dad. No one could be sure what kind of you, it might have looked exactly like you. 2.The group borrowed the painting and brought it back to the school in Tucson. What if he got a guilty conscience and brought it back? I must have brought it back after the lecture this morning.